A report published Thursday showed that 3.1 million smartphones were stolen in the US last year, that’s a big jump from the 1.6 million figure in 2012. Losing devices continues to be a serious problem too, with 1.4 smartphones going missing for good in 2013, compared to 1.2 million a year earlier. The figures were drawn from Consumer Reports’ State of the Net survey involving 3,100 US-based adults. Of course, with more and more people owning smartphones, it’s little surprise that such incidents are on the rise, so perhaps it should be more of a concern that owners appear to be doing little to secure their devices in case of theft or loss. Although the data revealed a 50 percent year-on-year increase in the number of phone owners setting a screen lock with a 4-digit PIN, only 36 percent of handset users currently do so. Indeed, it seems most smartphone users are still somewhat lackadaisical when it comes to the issue of handset security, with few user taking extra measures to guard their device’s data. Only 14 percent, for example, have installed an anti-virus app, while just 11 percent use a PIN longer than 4 digits, or a longer password or unlock pattern. Incredibly, 34 percent took no security measures whatsoever. 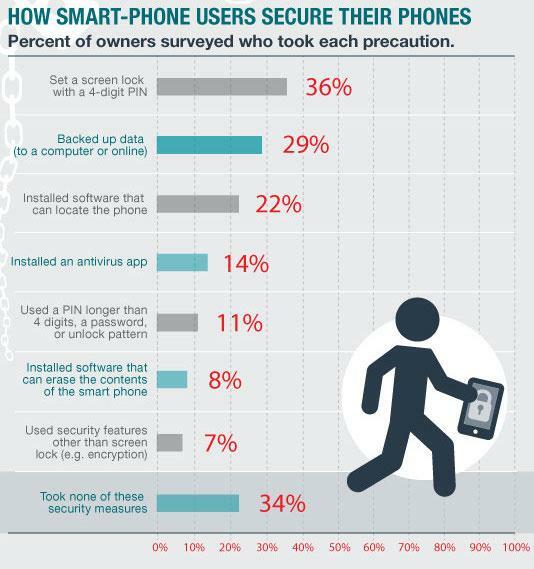 The results of the survey come in the same week that the Cellular Telecommunications and Internet Association (CTIA) announced the Smartphone Anti-Theft Voluntary Commitment that’ll see anti-theft software pre-loaded – or offered as a download – onto handsets from July 2015. The initiative is backed by tech giants such as Apple, Google, HTC, Huawei, Motorola, Microsoft, Nokia, and Samsung. For some lawmakers, however, the CTIA’s move doesn’t go far enough, and in light of Consumer Reports’ findings, they may have a point. New York Attorney General Eric Schneiderman and San Francisco District Attorney George Gascon, for example, have for some time been calling for the mandatory inclusion of anti-theft software on smartphones, while California lawmaker Mark Leno, described the CTIA’s pledge as an “incremental yet inadequate” step to deal with the growing problem of theft. The Johammer J1 is no slug -- or is it?